First off, let me get one thing clear: Chilli con Carne means Chilli with meat. 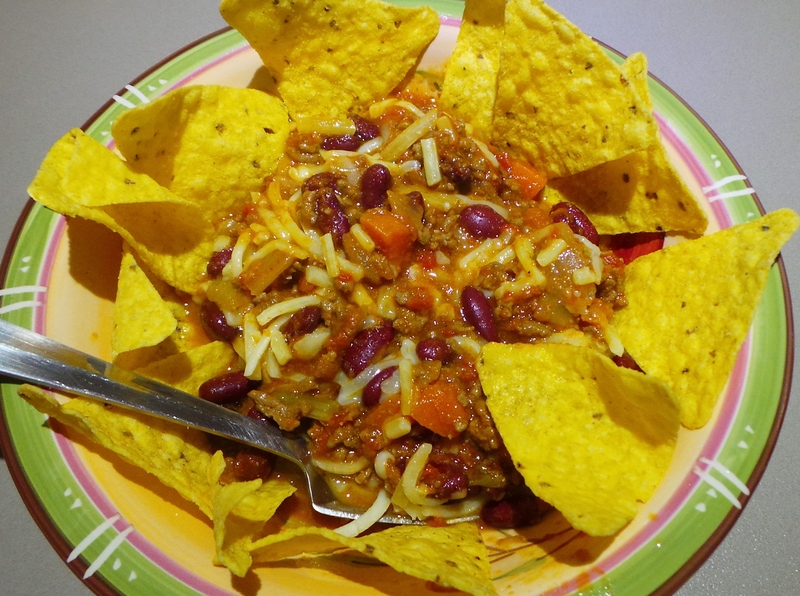 There is no such thing as Vegetarian Chilli con Carne. This is a dish I have adapted from one of Jamie Oliver’s recipes out of his book, Happy Days with the Naked Chef. I pretty much follow his recipe but get rid of a lot of fiddling around. I also tend to cook it in a slow cooker, but I’m guessing that this surprises precisely no-one. My step-father is a fiend for chilli. When I lived in Canberra, and knew he was driving up from Melbourne to see me, I would get this dish to the long simmer stage the night before and pop it in the fridge overnight. I’d put it in the slow cooker on low just before I went to work in the morning and it would be gorgeous by the time I got home to find him waiting for me. Nowadays, I find it perfect for cold to just-bordering-on-utterly-miserable days. Put it on early and leave it to do its thing until you’re ready to eat. In the meantime, your home smells gorgeous. Leftovers are not to be scoffed at. You can cook this on the stove top, in the oven or in the slow cooker (3 litre size for this recipe). Whatever works for you. It makes a whole heap, so you can feed a crowd, make a ton of leftovers to eat during the week for a singleton or individual frozen meals for future famines of inspiration. Start with a chopping board, a knife and some vegies. If you intend to cook this on the stove or in the oven, you’ll want a Dutch oven style pot with a tight-fitting lid. Get your slow cooker set up if that’s what you’d prefer to use. In this case I also put the cooker on low and empty the tins of tomatoes into it – just to get it warmed up and going. Get your slow cooker on-line. 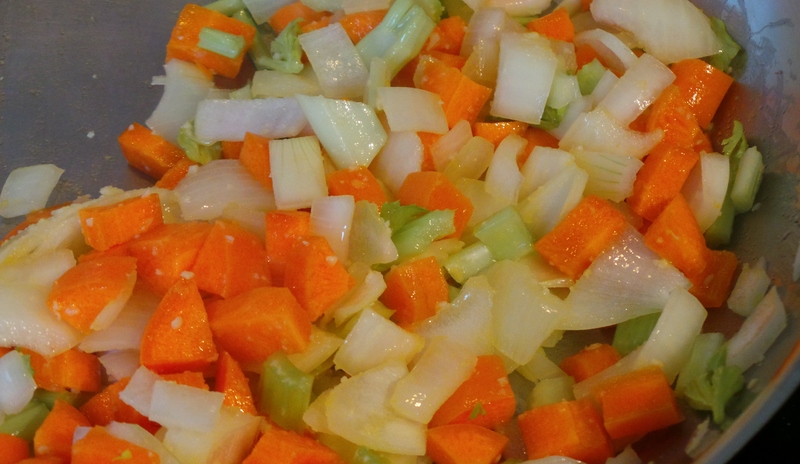 Now, dice up an onion, a stick of celery and a carrot as finely as you like (or are able). Start by sauteeing the trinity. Add your chopped vegetables and a teaspoon of crushed garlic. I don’t mind if this comes from a jar. Cook gently until the onion softens and becomes translucent. 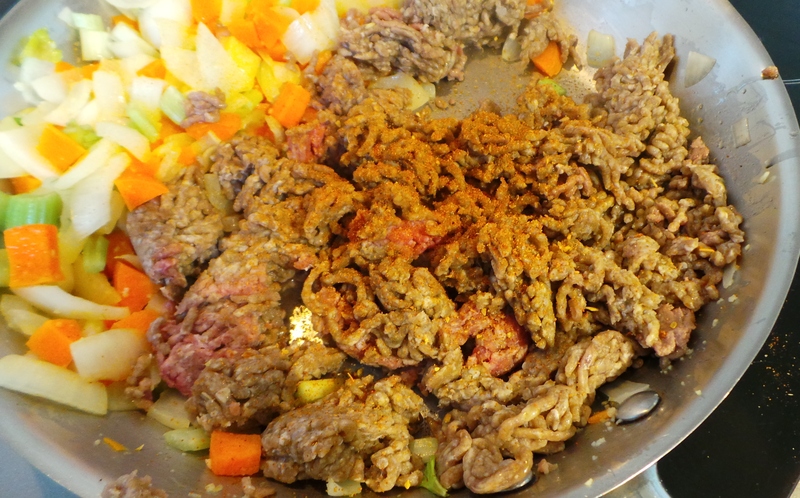 Now add your minced beef. You’ll want about half a kilo or a pound of meat to serve four. Continue to fry, stirring gently to brown the meat almost all the way through. I like to push the vegetables aside at first, but do what works for you. Once it is browned sufficiently, you can add a mix of ground cumin, chilli powder and fresh chilli OR you can use whatever commercial chilli blend you prefer. Make it as hot or as mild as you wish, but add the spices at this stage to fully release the aromatic oils that they contain. Add your meat and spices. 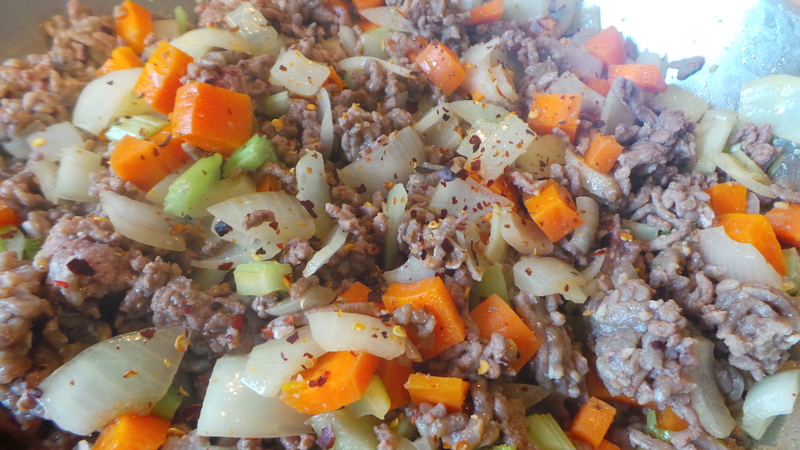 Mix it all together as thoroughly as you can, just to get those flavours a little more melded. 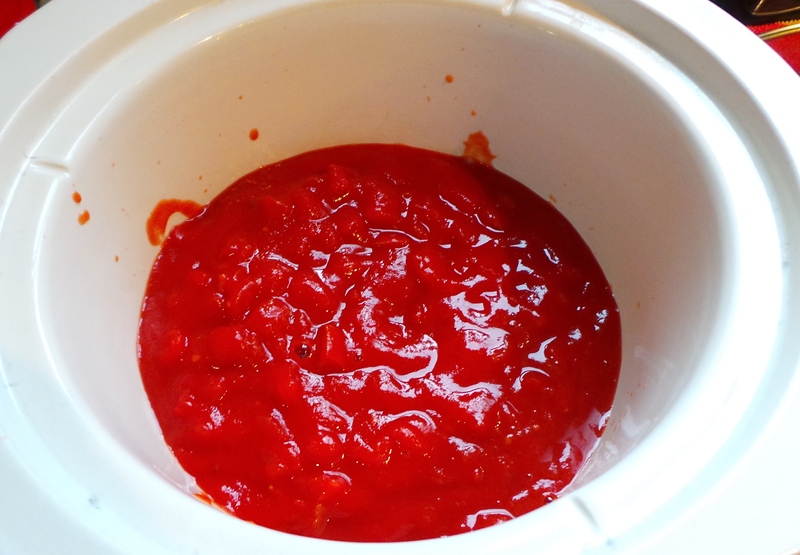 If you are using the slow cooker, then transfer your mixture into it now. 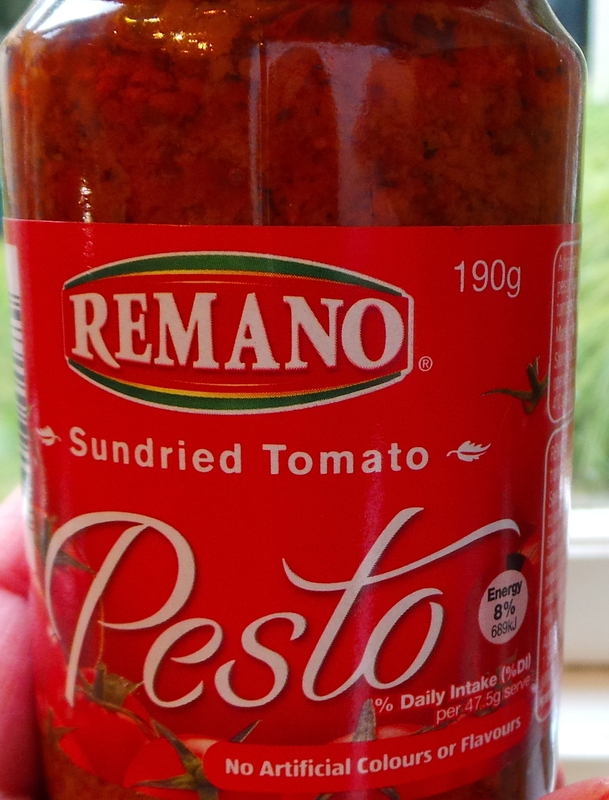 Add the contents of 2 x 400 g tins of diced tomatoes and a small jar of sun-ripened tomato pesto. I get the latter from Aldi. It only costs $2 and is quite affordable for the punch of flavour it gives. You may wish to drain off some of the oil from the top of the jar, but this isn’t necessary. It’s a matter of taste. Bring the mixture to the boil and place a piece of greaseproof paper between the pot and the lid. Turn the heat down to simmer on the stove for 1-1½ hours. Alternatively, transfer to the oven for the same amount of time. Add the tinned kidneys beans about 30 minutes before serving to allow them to warm through. I forgot to strain the oil off the pesto – can you tell? Serve with crusty bread, on plain steamed rice, on boiled pasta as a meat sauce, on mashed potatoes, over corn chips, topped with a cornbread cobbler (recipe coming soon) or in tacos or burritos. Have your way with it. Goodness, you could even top it with mashed spud and call it Shepherd’s Pie if you want. It’s a really versatile dish. Enjoy. I x 190 g jar sundried tomato pesto, excess oil drained from top and discarded. Preheat oven to 150°C/ 300° F, if using. In a metal pan or casserole with a tight-fitting lid, heat olive oil gently. Add diced vegetables and garlic until onions are softened and translucent. Add the contents of the jar of pesto and the two tins of diced tomatoes with a small glass of water. Stir well and add cinnamon stick. Bring to a boil, cover with a sheet of greaseproof paper and the lid and reduce heat to a simmer. Cook for 1½ hours on the stove top or transfer to the oven for 1½ hours. At the 1 hour point, add the kidneys beans and stir thoroughly to warm through. Prepare a 3 – 4 litre (quart) slow cooker. Follow directions as above to the ∗ using a medium sized frying pan. Transfer contents of pan to slow-cooker and add the contents of the jar of pesto and the two tins of diced tomatoes. Stir well and add cinnamon stick. Bring to a boil on High, then reduce heat to LOW. Cook for 3-6 hours, stirring occasionally to prevent sticking. 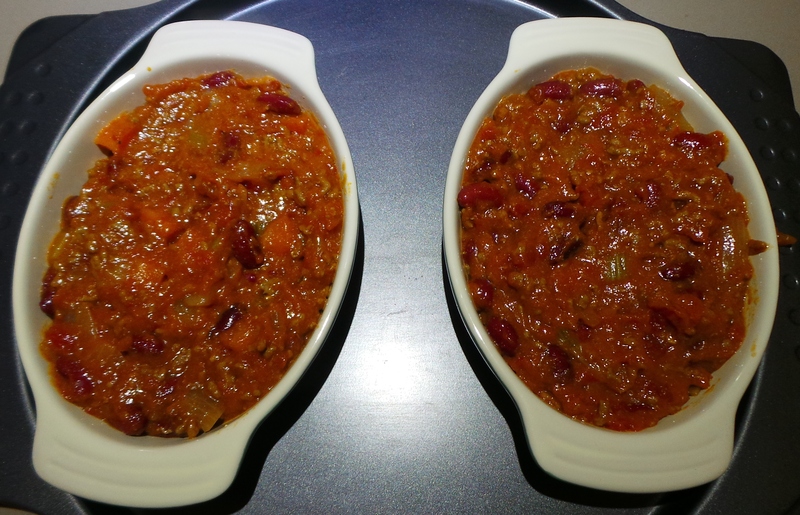 30 minutes before serving, add the kidney beans to heat through. If the mixture is too wet, sauce may be thickened using cornflour, or soaked up using a cobbler topping. Hey, Sharon, this looks really yummy. How can I make it kid-friendly? 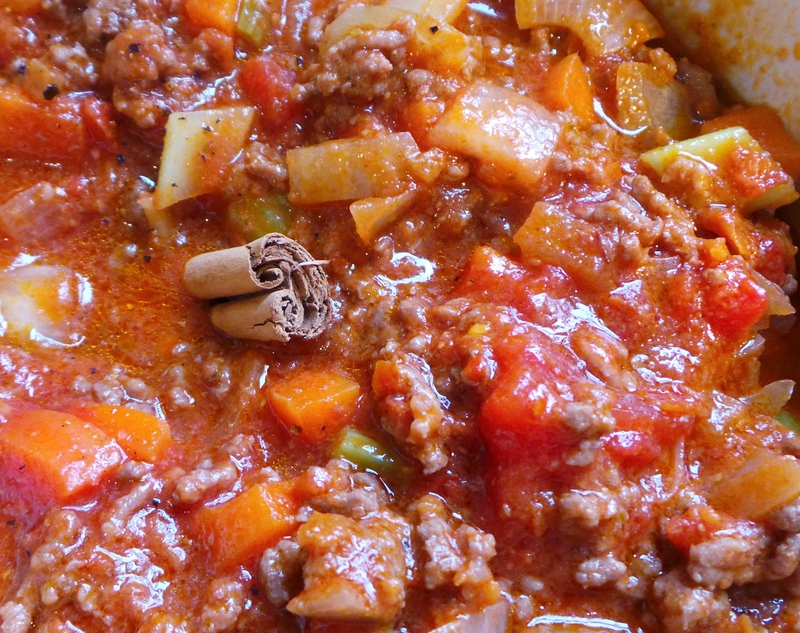 How much chilli to add for kids who don’t like spices? Or just leave it out altogether? Hi Dorothy! With kids, I’d leave out the fresh chilli and chilli powder. Maybe just use ground cumin and coriander (good deals to be found on spices at the Shep Cannery btw). If you have it, try a sprinkling of sweet paprika. 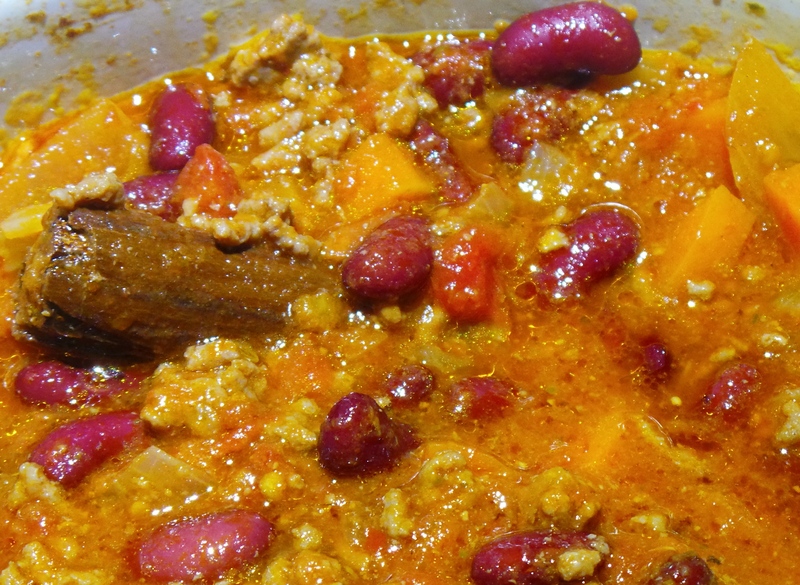 I find chilli flakes add a touch of heat without the ‘bite’ of a powder, so you may want to add a few the next time you make it and just introduce them to heat gradually. Also, perhaps call it ‘Cowboy Beans’ if you think mentioning the word chilli might launch strike action! Thanks, Sharon, I like that combination. Will try this one soon. All printed off and ready to go. mmmmm, delish! We had chilli con carne last night. With rice and sour cream.